I love it when I discover a book through sheer serendipity! 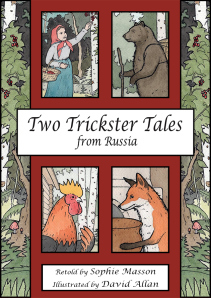 I came across Two Trickster Tales from Russia via the ASA (Australian Authors Association) because they noted its launch in Sydney. Having been to Russia only last year, and still very interested in their fascinating culture, I couldn’t resist whizzing off an email to the publishers to plead for a review copy. And it is gorgeous! The first story, Masha and the Bear is reminiscent of Goldilocks and the Three Bears, but Masha, who stumbles into a log cabin and scoffs the porridge because she’s lost isn’t discovered sleeping in bed by a cute little baby bear. No indeed, it’s a very large, very scary Russian brown bear that comes home, and his reaction is to keep her captive so that she can cook and clean for him. Every day, she cooked and cooked; berry porridge, mushroom pancakes, honey cakes, fish pies. The bear ate and ate, leaving only crumbs for Masha, so she got thinner and lighter while he grew fatter and ruder. She kept her spirits up by whistling her grandfather’s tunes, while she tried to think of a way to escape. And then one day she had an idea. I’m not surprised that a Russian folktale features an enterprising female character. According to our tour guide in Moscow, Russian women have to put up with a lot from their vodka-drinking husbands, and women need to have initiative. Masha is a rare example of a trickster female, and her way of escaping is very cunning indeed. The story of The Rooster with the Golden Crest follows the traditional three-perils-before-rescue format. A cat, a thrush and a rooster live happily together until a fox turns up to lure the (not-very-bright) rooster to his almost-doom. Just like the Seven Dwarves who warn Sleeping Beauty about the Wicked Stepmother, the cat and the thrush tell the Rooster not to listen to the seductive words, but of course he does, and they have to rescue him. It’s a near thing, but all’s well in the end, and the fox finally makes a promise that she’ll leave the woods and never return. The pictures by David Allan are gorgeous. He’s rendered them in a most appropriate classic style, which on his website he says is ‘reminiscent of illustrators such as Arthur Rackham and Ivan Bilibin’. The pages alternate between full colour and sepia tones, and he’s especially good at depicting the facial expressions of the animals. The triumphant fox (about to get its just desserts) is especially good, click this link to see it. The book is easy reading in a large clear font. My only complaint about the production qualities is that it doesn’t have a barcode for easy scanning into a library catalogue (or, presumably, at the bookseller’s till). Why did we start Christmas Press? Well, we love the gorgeous classic picture books that we grew up with, the kind which featured retold traditional stories and beautiful illustrations, opening children–and their families–to a wealth of wonderful tales from around the world, books you often got as presents and that made you feel like every day was Christmas. Sitting around discussing these one day, we were musing about how there just weren’t enough of them around any more. But rather than complain about it, we decided to do something about it–and Christmas Press was born! They’re based in Armidale, NSW, and there are contact details on their website. This is a lovely book for widening children’s exposure to other cultures, and it’s a must-have if you have students from the Russian Federation at your school. Students in years 2-4 will enjoy comparing it to similar folk tales, and they will love joining in the rhymes. To buy Two Trickster Tales, click here. Source: Review copy courtesy of Christmas Press.